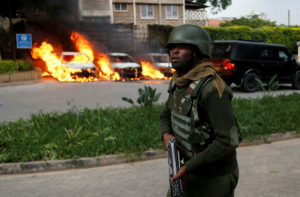 NAIROBI, Kenya — Extremists launched a deadly attack on a luxury hotel in Kenya’s capital Tuesday, sending people fleeing in panic as explosions and heavy gunfire reverberated through the complex. A witness said he saw five bodies at the entrance alone. Al-Shabab — the Somalia-based Islamic group that carried out the 2013 Westgate Mall attack in Nairobi that left 67 people dead — claimed responsibility. “It is terrible. What I have seen is terrible,” said Charles Njenga, who ran from a scene of blood, broken glass, burning vehicles and pillars of black smoke. The coordinated assault began with an explosion that targeted three vehicles outside a bank, and a suicide bombing in the hotel lobby that severely wounded a number of guests, said Kenya’s national police chief, Joseph Boinnet. Survivors reported hearing a shattering blast and saw people mowed down by gunmen as they sat at a cafe. Victims were left lying on tables, bleeding. Authorities sent special forces into the hotel to flush out the gunmen believed holed up inside. Well after nightfall, more than five hours after the attack began, Boinnet said the operation was still going on. It was not clear how many attackers laid siege to the complex, which includes the DusitD2 hotel, along with bars, restaurants, banks and offices and is in a well-to-do neighborhood with large numbers of American, European and Indian expatriates. Boinnet did not disclose the number of dead. Associated Press video from inside the hotel showed Kenyan security officers searching the building and scared workers emerging from hiding while gunfire could still be heard. Some women climbed out of windows. One man got up from the floor where he appeared to be trying to hide under a piece of wood paneling, then showed his ID. Like the attack at the luxury Westgate Mall, this one appeared aimed at wealthy Kenyans and foreigners living in the country. It came a day after a magistrate ruled that three men must stand trial in connection with the Westgate Mall siege. A fourth suspect was freed for lack of evidence. In 2015, al-Shabab claimed responsibility for an attack on Kenya’s Garissa University that killed 147 people, mostly students. Tuesday’s violence also came three years to the day after al-Shabab extremists attacked a Kenyan military base in Somalia, killing scores of people. Tuesday’s carnage demonstrated al-Shabab’s continued ability to carry out spectacular acts of bloodshed despite a dramatic increase in U.S. airstrikes against it under President Donald Trump. Tourism — an important source of revenue in Kenya, where safaris are a major attraction — has suffered because of the bloodshed. Gunfire could be heard for hours after Tuesday’s attack began. Some people ducked behind cars, screaming, while others took cover behind fountains and other features at the lush complex. A bomb disposal unit was called in, and police blew up a car that had explosives inside. A grenade was also seen in a hallway at the complex. Security forces hurried out a large group of women, one of them still in curlers. Dozens of others were rushed to safety as plainclothes officers went shop to shop in the complex. Some people held up their hands to show they were unarmed. Despite the years of bloodshed, the Kenya-Somalia border remains porous, with al-Shabab extremists able to easily bribe their way across, according to a U.N. panel of experts.